We arrived in Bangkok from Surat Thani on a night train. Because we traveled on a budget, we chose the cheapest option possible, which was a 3rd class ticket. 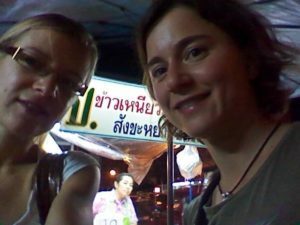 We started from Koh Phangan, (our favorite place in Thailand so far) by boat and took the night train from Surat Thani heading to Hua Lamphong station in Bangkok. The train journey was an experience in itself! There were straight wooden benches close to each other in the 3rd class carriage, with locals sitting closely packed, happily chatting and sharing food. There was a separate area for monks to sit, there weren’t too many of them so they were more comfortable than us. When it got dark, the people got quiet and they went to sleep on the hard benches and on the floor. You will realize that some locals can sleep virtually anywhere. We followed their example and put a sarong on the floor (you can use a sarong for so many things!) lied down on it and tried to sleep. All our bones and joints hurt by the time the sun came up, but then we arrived in Bangkok and were so thrilled to be in this busy crazy city once again!